The dumpster in the MWP parking lot is for Clubhouse and Pool usage. We have been finding lots of yard debris, boxes and carpeting inside the dumpster. We need to have the dumpster available for our rentals to use for their trash. Please refrain from using the dumpster for personal use. On May 18, 2019 we will finally be replacing the pool deck. We are asking for volunteers to help with tear down the week leading up to the 18th and also for construction help on the 18th. We will have all of the lumber at the pool for the new deck. MWP will supply bottled water and pizza for all who help build the new deck. If you could email meridian.woods.park1@gmail.com to let us know if you could help that’d be awesome so we have a list of volunteers to expect and also so we purchase enough water and pizza. A Guest Pass will be available for a fee of $30 and will allow residents to bring up to 2 guests per adult pass per day during the season. We will not be doing daily guests this year, in order to bring a guest all residents must have a guest sticker on their pool passes. If you have already received your pool passes this year, please bring them back to the office if you wish to purchase the guest pass. REMEMBER – No daily guests this year! Everyone must have a guest sticker in order to bring guests to the pool. There will be no office hours the week of 4/28-5/5. I will return to the office on 5/6/19 from 5pm – 8pm. If you need any assistance please do not hesitate to contact a board member in my absence. 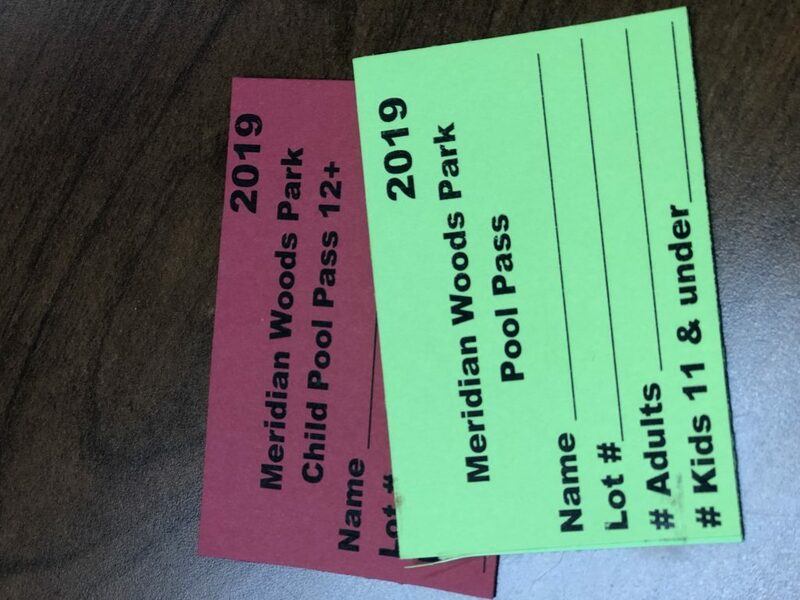 If you have already paid your 2019 HOA Dues, stop on by to obtain your new 2019 pool passes! We have changed the look completely this year, so go ahead and toss those old yellow ones they are no longer good! Office hours will be held this Thursday, March 14th from 9am – 2:30pm instead of Wednesday, March 13th. I will be in the office on Tuesday, March 19th from 9am-2:30pm. The office will be closed Wednesday March 20th. I will return to the office Monday, March 25th at 5pm. Crime Watch reduces crime in your neighborhood, reduces the fear of crime, and builds a strong relationship between the community and the police department. You and your neighbors can help each other protect your entire neighborhood and make local law enforcement agencies more effective in the fight against crime through your involvement and participation. A Neighborhood Crime Watch project is the logical first step for any community organizing against crime; it requires minimal effort and gets people talking to and caring about one another. It encourages participant neighbors to get to know each other and their routines, so that any out of place activities can be observed, recognized for what it is and reported in order to be investigated by the IMPD or other city agencies. The program also teaches participants techniques to reduce the risk of being victimized at home, in their vehicles and in public places. It trains participants on the importance of recognizing suspicious activities and sounds, evaluate them and to report them properly. 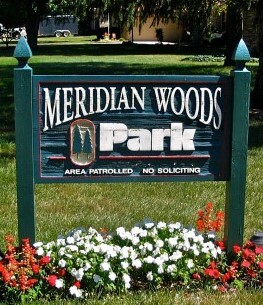 We are currently seeking interested applicants to join our Meridian Woods Park Home Owners Association Board. MWP Board Members come to our monthly board meetings (2nd Monday of every month at 7pm) and help keep our neighborhood running smoothly. This is strictly a volunteer position. If you are interested, please stop by the clubhouse Monday’s (5pm – 8pm) or Wednesday’s (9am – 2pm) or email meridian.woods.park1@gmail.com. Please consider joining us to keep our neighborhood the amazing place that it is!